Correct Wheel Sizes, PCD, Offset, Rims and Tire specs for Subaru SVX series. The stock tire size for a SVX according to the owners manual is 225/50r16 and a rim size of 16x7.5. 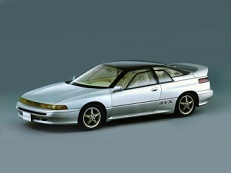 Subaru SVX OE tire size/speed rating: You show 225/50/ZR16. All years 1992-97 "V" spd rating not "Z"